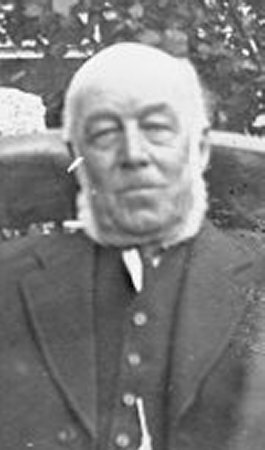 "....Thomas BROOKS, a lead miner, husband of Emma Matilda BROOKS, maternal grandfather of Florence SLACK. Thomas & Emma married on 17 Sep 1863 and had eight children. In 1881 they lived in Main Street, Middleton.Photo taken in 1930. " In July 2006, Jo Williams sent the following newspaper cutting. Mr T.Brooks celebrates his 85th birthday. Mr Thomas Brooks, Middleton's oldest resident, celebrated his 85th birthday last week, and was the recipient of many congratulations. 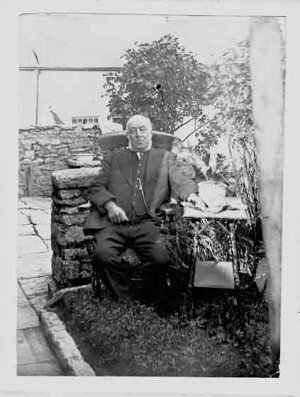 Mr Brooks, who is confined to his bed, is a native of Middleton, and was born in 1843 in the same house in which he now resides. He was the son of Mr Samuel Brooks, a lead miner, and when about ten years of age started as a "server", carrying the ore to be washed. In those days there was no machinery to dress the ore and it had to be washed at the top of the mine by women. The women began their work with hand sieves at 8 am and did not finish until 4 pm, the pay being 1s 6d per day. The boys who carried the ore were paid 6d per day. When 12 years of age Mr Brooks started work in the lead mine "Ratchwood". He delighted in talking of old times, and while chatting to our representative told how he used to be taken to Carsington races, which in those days was an important event. Mr Brooks has a splendid memory and is able to give correct dates of past events. He remembers when there was no railway between Cromford and Matlock, and he also recollects the High Tor tunnel being driven through, his father having helped in its construction. one at the top, the middle tap, and the alley tap. He spoke of the time when a tinder box and flint and steel were used to obtain a light. Mr Brooks also recalled to mind a tragic event, when three thatched houses which stood on ground in front of the house now occupied by Mr Tom Walker were burnt to the ground. It appears that the tenant of one of the houses was "rather partial" to pancakes and, expecting some for his dinner one day, he was bitterley disappointed to find that his wife had not produced any. Asking for an explanation, he was told that she had no fat in which to fry them, and with the exclamation "I will soon find you some fat", he brought some tallow candles and threw them into the pan, with the results that the chimney and thatched roofs of the houses took fire and the premises were burnt to the ground. Mr Brooks was married to Miss Emma Matilda Doxey, daughter of Mr Thomas Doxey, Hopton. There are eight children of the marriage (two sons and six daughters), the eldest being 64 years of age. Mr and Mrs Brooks were married at Middleton Holy Trinity Church by the Rev. R Denman Norman, who has just celebrated his 100th birthday. Mr Brooksis a non-smoker. He has been a life-long Primitive Methodist. Until two years ago he was often seen taking his favourite walk on the Gellia Road. His youngest daughter now lives with him, his wife having died 39 years ago. From the Derbyshire Times 1931? Many Mourners at Funeral of Mr Thomas Brooks. Mr Thomas Brooks, aged 88, who died at New Road, Middleton, on Friday, was the oldest resident of the village. He lived with his youngest daughter and her husband, Mr and Mrs J Wigley, his wife having died 40 years ago. He started work at the age of 10 as a "server" on the top of a lead mine, and two years later went down the mine and was in that occupation until he retired at the age of 70. As a youth, he was a chorister at the Parish Church, where he was married by the Rev Denham Rowe Norman, who recently died at the age of 103. There were eight children of his marriage, six daughters and one son of whom are living. There are 26 grandchildren and 13 great-grandchildren. As a Primitive Methodist, Mr Brooks was a trustee of the local church. He was also keenly interested in sport and was a non-smoker. The funeral took place at Middleton on Monday at the new cemetery, a service in the P.M. Church being conducted by the Rev S A Price, assisted by the Vicar (the Rev Basil Dawe). Three hymns were sung. Mrs Harrison was organist. Mourners were:- Mr W Brook (son); Mr and Mrs Edward Mather, Mr and Mrs P Boden, Mansfield, Mr and Mrs John Slack, Mr and Mrs Thos Flint, Wirksworth, Mr and Mrs george Slack, Mrs John Wigley (sons-in-law and daughters); Mr S Brooks, Bolsover (daughter-in-law); Mr John Wigley, Mrs William Brooks, Mr T Brooks, Shirebrook, Miss Ada Flint, Mr John Slack, Mr John Wigley, junior, Mrs Henry Jepson (grand-children). Among those present at the church were Mrs Johnson, Mrs Charity, Mansfield, Mrs Arthur Boden, Mrs Bristoe, Mansfield, Mrs C Slack, Mrs Sidney Flint, Mrs N Harrison, Misses E Mather, D Slack and Doris Flint (granddaughters); Mr and Mrs Hilditch, Wirksworth; Mr Macbeth, Wirksworth; Mr J Walker (P M Church Circuit steward); Mr Henry Slack (society steward); and Mrs John Walker. Representing the Wesleyan Church were Mrs Martin and Mrs A Millward. Flowers were sent by:- Arthur and May; Ada and Fred; Annie and Billie (Mansfield); Emma, Jack and Jackie; Nellie,Tom and family; Emma, Ernest and family (Denton); Lydia, George and family; Will and Georgina; Florrie and Walter; Hannah, Ted and family; Sarah Ann and Peter; great-grandchildren (Buxton); Mary rose, Jack and family; Mrs Geo Brooks (Wirksworth); Mr and Mrs H Jepson and family; members of the P M Church; his little friend Enid (Mansfield); Dorothy; Mrs S Brooks and family; Mr and Mrs B Hilditch and Maitland; Lewis and Brewin; all the neighbours; Mr and Mrs A Meredith and family. Thomas Brooks daughters Hannah born 1864 married Edward Mather..They adopted Harriett Janet Field Woodiwise (daughter of Samuel Woodiwisse) who married my Uncle Sidney Flint my father's brother Uncle Sid Chief Engineer at John Smedley Lea Mills formerly a Mining Engineer at Bolsover Colliery where others of my kin were miners and pit deputies.. Harriett was known affectionately within the family as Aunt Dolly Mather.. In recent weeks I have had her family history sent to me from the Field family of Long Eaton.. The Circuit MInister who led the funeral service was my Uncle Rev Sidney Austin Price (married my mother's sister Elsie Walker) Uncle Austin was born at Wem Shropshire to Welsh parents his family having an engineering works at Birmingham...From Wirksworth Circuit Uncle Austin and Aunt Elsie went to Retford Methodist Circuit living near Ranskill where Elsies sister Doris in the 2nd W.W.lived with them when Doris was a General Manager at Ranskill Ordnance Factory sent there by Mr John Bertram Marsden Smedley Managing Director of Lea Mills where Aunt Doris was General Manager over the Womens section up to 1960..
Middleton village was a close knit community up to the 1950s most of the inhabitants were blood related... The Mrs Harrison who was organist at Mr Brooks funeral would be, I believe, wife of Mr John Harrison whose heirs still live at Middleton today..being related to my wife and distantly to my own family .